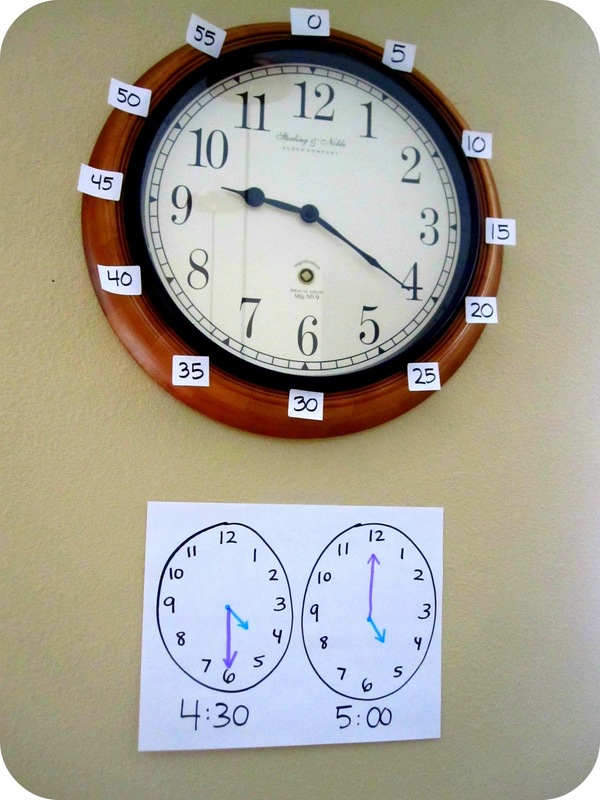 I decked out my clock with numbers by 5 to 55 using sticky labels. 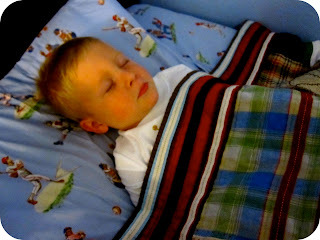 He's not ready to tell time by 5s yet, but I taught him my "counting by 5s" chant anyway. He was curious when I said 4:30 and the long hand was pointing to the 6... not to the 30. I love grabbing his curiosity and running with it. 4:30 was when dad was coming home on Sunday, 5:00 was dinner. I also taught him the old adage "a watched pot never boils"... since he stared at that clock so long that I thought he might be able to will the hands to speed up time. 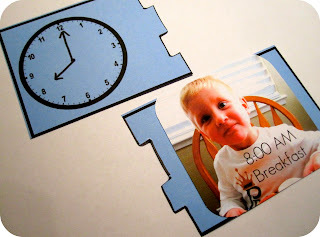 To have a little fun with time... and practice just simply recognizing time by the hour, I created some simple time photo puzzles. You can download our time puzzle template here. Our first round was just hand drawn pictures... and then I started snapping photos. Do whatever is easiest for you! For the photos, I took pictures of the little guy acting out various events that happen throughout our day: eating breakfast, going to preschool, riding bikes, waking up, going to the park, etc. Then I stuck a photo on each puzzle and we labeled each with the correct time (digital and analog). For example, I told my little guy what time breakfast is normally and then I had him point to that time- 8am. He showed me where the hour hand (little hand) pointed and then where the minute hand (long hand) was supposed to point. I drew where he pointed. I finished up by cutting the puzzles apart and then we spread several puzzle pieces out and had him try to match the correct analog clock with the matching digital clock + picture. We are planning to use our puzzles as we talk about our schedule tomorrow. We'll stick them up on the wall and practice sequencing and number order. 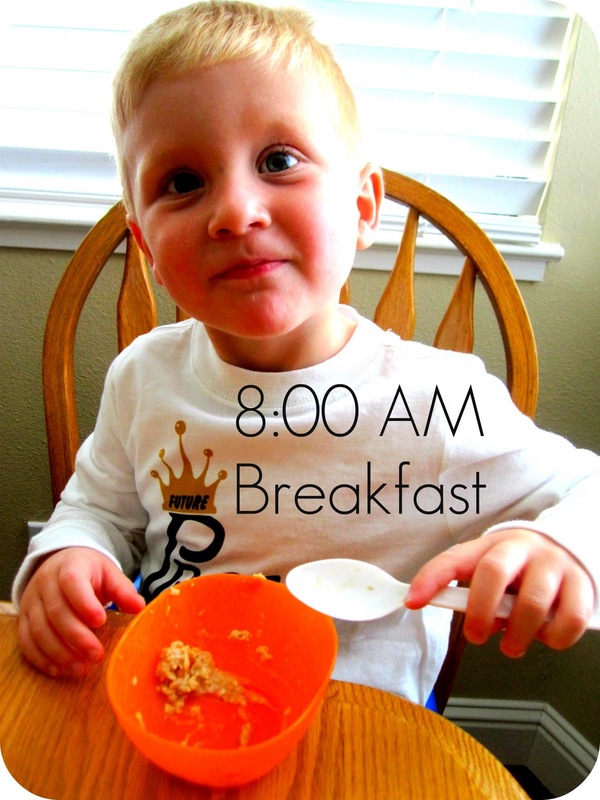 I can already tell he is going to be confused about why there are two 8:00 (AM/PM)... so we'll be discussing that too. 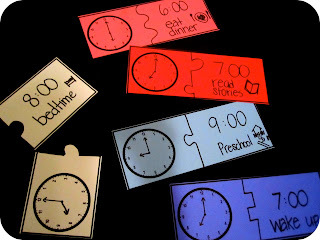 Telling time is such an awesome skill to teach in context and is so much more meaningful when it is taught in real-life... instead of using lots of repetitive worksheets! 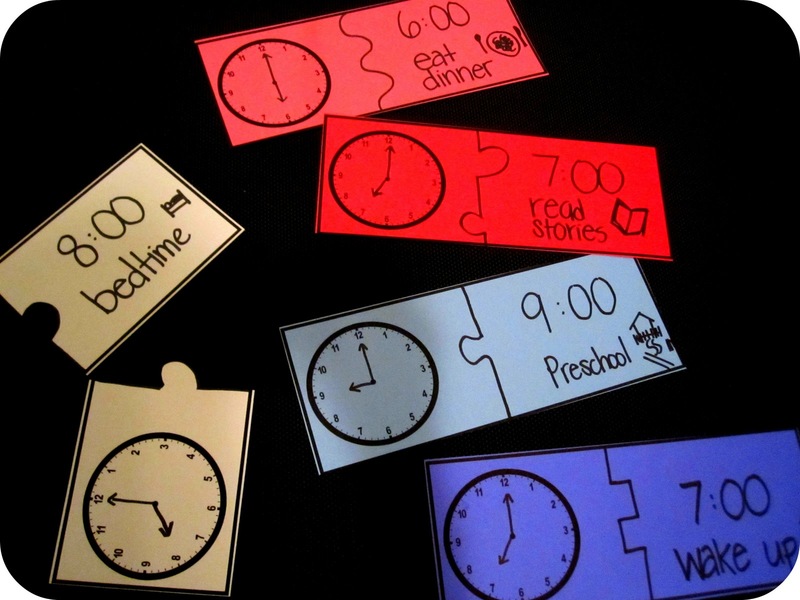 We love tying time telling to our favorite activities and daily events each day! 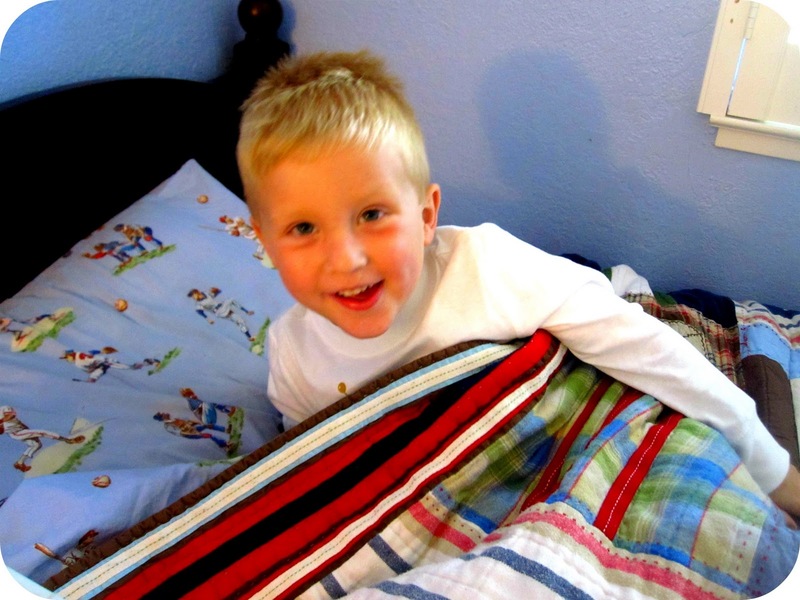 Do you have any other favorite fun time telling activities that you embed into your day? Does your child wear a watch? Do you? I am so used to always having my cell phone with me that I don't!